Body Finish is a very high-quality and fast drying 1-component acrylic lacquer, specially developed to spray new or repaired sheet metal as well as parts of machines giving them an OEM finish. 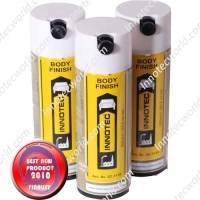 Body Finish has been specially developed for the automotive, truck and agriculture sector where it is the ideal solution for finishing repaired or (partly) replaced sheet metal such as inner-skin panels, back panels, boot floors, interior of front and rear panels, but also A-pillars, etc. Besides, Body Finish is also perfectly suited for being used in industrial applications, for example as machine paint or temporary anti-corrosive repair lacquer. Body Finish owes its high value to the fact that it puts an end to the long drying and evaporation times of water-based lacquers. Body Finish is compatible with most paint systems, both water-based and solvent-based. The product is ready-to-use, thus putting an end to mixing times as well as disposal of lacquer surplus which is considered as chemical waste. Moreover, no spray-gun has to be cleaned when using Body Finish. Body Finish is suited for being used on both large and small surfaces since the aerosol is provided with two flat spray nozzles with different capacity. The surface must be clean, dry and free of dust and grease. Sand the surface, preferably with a sanding block. Clean metal surfaces with Innotec Multisol or Innotec Seal and Bond Remover. Provide untreated metal with a primer (Innotec Speed Primer or Innotec Zinc Coat). Clean plastic surfaces with Innotec Repaplast Cleaner Antistatic and pre-treat them with Innotec Repaplast Primer New Formula. Shake can well during 2 minutes before use. Spraying distance 10-15 cm. Apply two smooth layers. After use, invert can and spray until clear to clean the nozzle. – 2 flat spray nozzles with different capacity. – Dust dry after 10 minutes. – Fast curing and impact-resistant. – Wet-on-wet paintable with almost any modern paint system after 20 minutes.